After watching The Polar Express movie last Christmas, I put my carefully planned idea into place: to take our two kids on our very own middle of the night “train” ride. 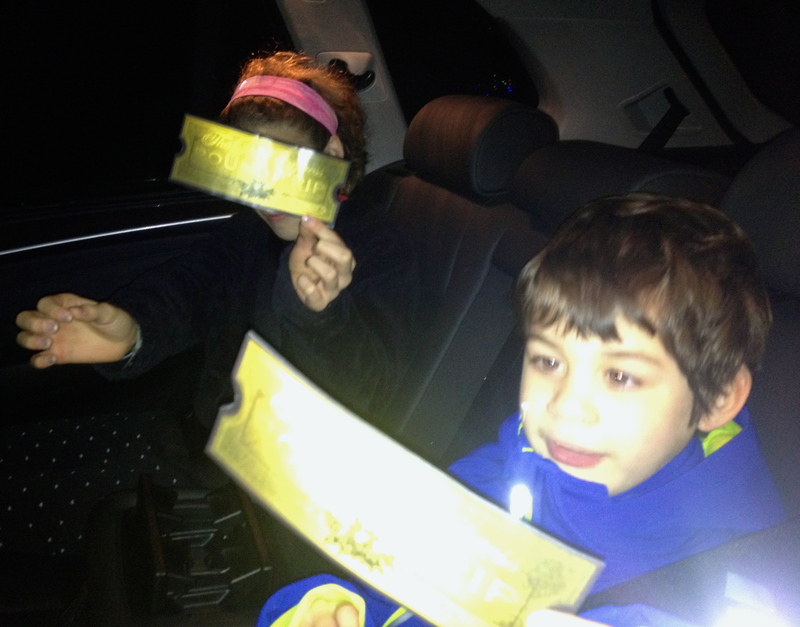 Wow, was it ever fun to wake them up in their beds and hand them their own Polar Express tickets! I initially got the idea to make our own Polar Express ride last year from a mom-friend who joked about how she & her husband would pile their kids into their Polar Express (aka family minivan) to go look at decorated houses and Christmas lights at night. That was a tradition we had, too (there’s some great neighbourhoods in town whose houses dazzle us with their light displays and festive, glowing yards each year) and our kids always love to go touring to see them. So last year I put her homemade train idea & our light tour tradition together! After watching the movie after an early dinner, we went to bed as usual. I tried to time it so they would be asleep slightly earlier than usual. About 45 minutes after they were solidly asleep, the plan was put in place. I made hot chocolate for all of four us and put it in a thermos with our traveling mugs, which I put in the car. 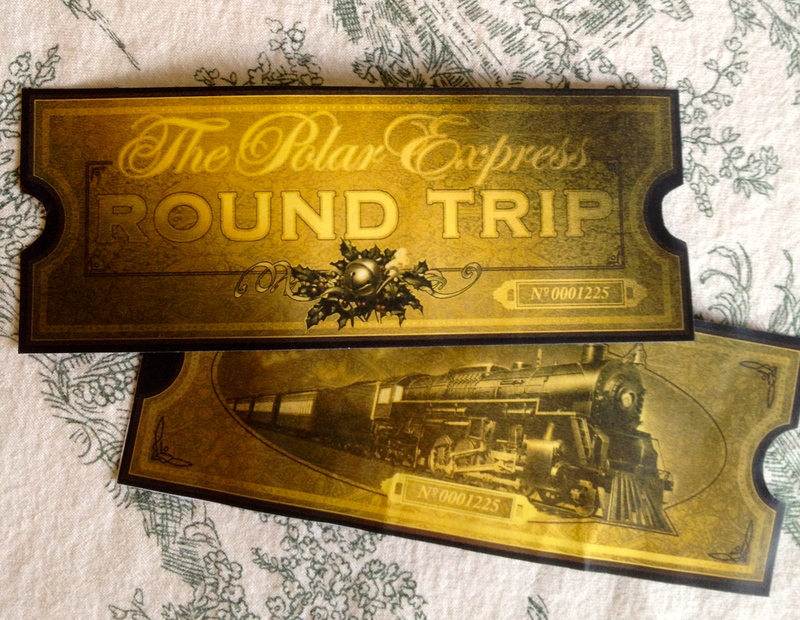 I played the movie’s train-approaching music and had the 2 tickets I had made earlier with my colour printer ready. Then I started calling, “ALL ABOARD!” outside their bedrooms to wake them up. They woke up so incredibly confused! I handed each of them their ticket and ushered them downstairs to put on their boots and coats over their pajamas. I announced that the Steyns family Polar Express was outside waiting, and we were off to look at holiday lights and have hot chocolate. The grins on their faces were wider than ear to ear. Once the confusion wore off, they were super excited to be heading off on a family adventure in the dark! Being a parent at Christmastime allows me to experience the wonder-filled days leading up to Christmas, singing songs, reading books together and watching movies through my kids’ eyes. This year both my 7 year old & 11 year old hear the bell and believe in Santa, and I’m really savouring every Christmas moment we can celebrate the magic. 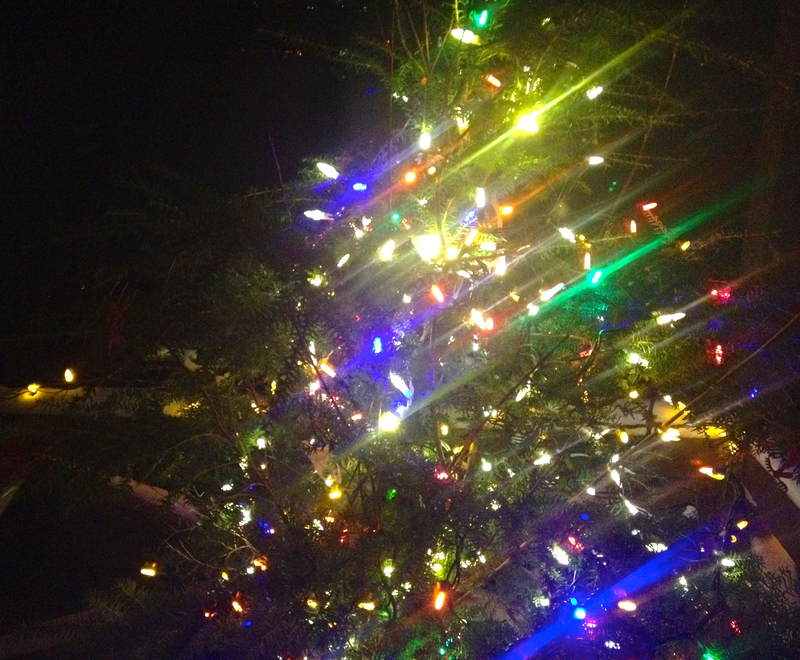 I’m sure you can recall your own family’s little traditions and unique holiday memories. Have you ever turned a favourite movie into real life? Merry Christmas, I am off to watch the Polar Express tonight! So it’s the last week of school before Christmas break, and my kids have been home sick. Poor things, I know. And for me it means three full days being trapped at home with sputtering, wheezing, sneezing little ones who are miserable and bored silly. I have a lengthy to-do list this week, with several important tasks to tick off before relatives start arriving on the weekend and an impending trip to the grandparents’, but what exactly am I doing? in the living room, of course! My kids have never, ever been great sleepers. As babies they would only sleep under perfect conditions -in their cribs in a quiet, dark room. Never would you see me in public with a peacefully dozing newborn! Rather, you’d notice the big red-lined eyes of my baby as she pays close attention to what is happening outside her seat or stroller. My darling baby son was the same way. I’m (mostly) at peace with it now, and over the years I’ve worked hard to create bedtime routines that, for the most part, work. But as all parents know, the gloves come off when kids get sick. So, in order to ensure my kids get some rest to feel better when they’re sick, I tuck them into bed with books & comics and ply them with soup, smoothies, and healthy snacks as their appetite allows. And if they can’t keep from jumping out of bed, I clear out the furniture for some balloon volleyball to tucker them out! We all end up sweating with efforts to keep the balloon from touching the ground as we pass back and forth around the room. 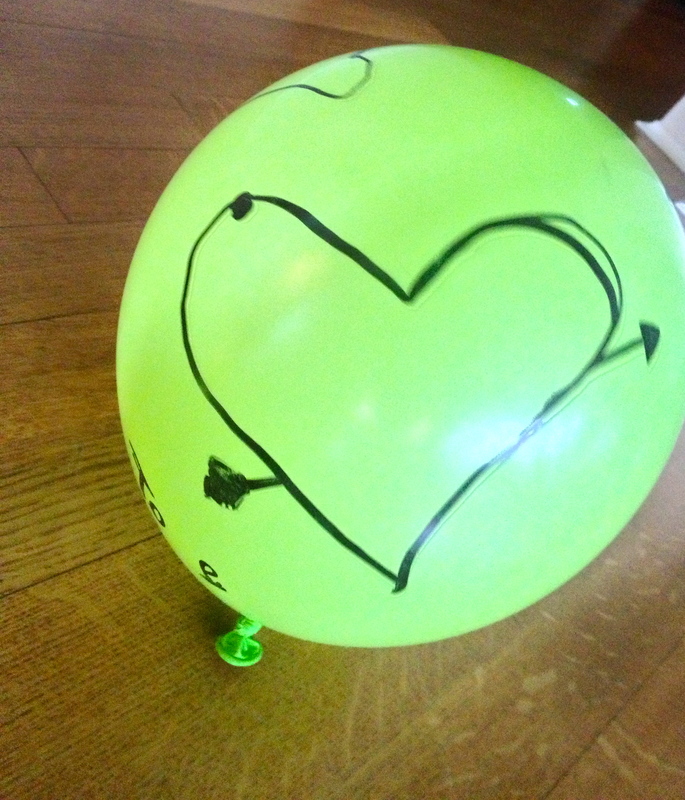 Today, we even made an ad hock centre line with string for passing the balloon over with only 3 hits. Soon they both flopped to the ground (well, me too) and I suggested we all go lie down in our beds. Do you have ways to cope with your kids at home sick? I hope your Christmas list is getting tackled, please wish me luck on mine!